Honey bees are a highly organized, social species, as demonstrated by their complex colonies and the geometric structure of their hives. For hive building, the honey bee strongly relies on its tactile sense, and a new video-article in JoVE (Journal of Visualized Experiments) illustrates a novel tactile conditioning experiment using honey bees. 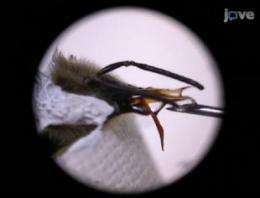 The technique, presented by the lab of Dr. Volker Dürr of Bielefeld University, trains honey bees to stick out their tongues when their antennae touch an object. This procedure allows researchers to analyze how changes in antennal movement correspond to tactile pattern recognition and learning. "We work with honey bees because they are an important model system for behavioral biology and neurobiology. They can be trained," Dr. Dürr says. "If you can train an insect to respond to a certain stimulus, then you can ask the bees questions in the form of 'Is A like B? If so, stick your tongue out.'" To train the honey bees, researchers let the antennae sample a textured surface, and then deliver sugar water. As the training proceeds, the honey bee will start to extend its tongue when it touches the associated surface. The researchers record the movement of the bee's antennae on video to understand how the bee uses active motion for tactile recognition. "It is clear that if a bee touches something with an antenna, a finely textured structure, the bee has to move it to get the information it wants. We don't fully understand the relevance of this movement," Dr. Dürr explains. By recording the antennal movements, Dr. Dürr hopes for himself and his students to gain clearer insight into honey bee behavior. Training new students can often be problematic for this technique. "We actually use this method in teaching often. The conditioning of the bees and recording of their antenna is better expressed in video." This article helps grow JoVE's articles on honey bees. Associate editor Allison Diamond tells us, "JoVE shows how research on an atypical subject, the honey bee, can be extremely beneficial to scientists, as the bees are a good species to train. Hopefully videos such as this will push other scientists to adopt similar techniques in their own research." I fell like I should bee seconding that! Pavlov's bees just doesn't have the same ring to it somehow? This method is too slow. They will never pass the SAT.